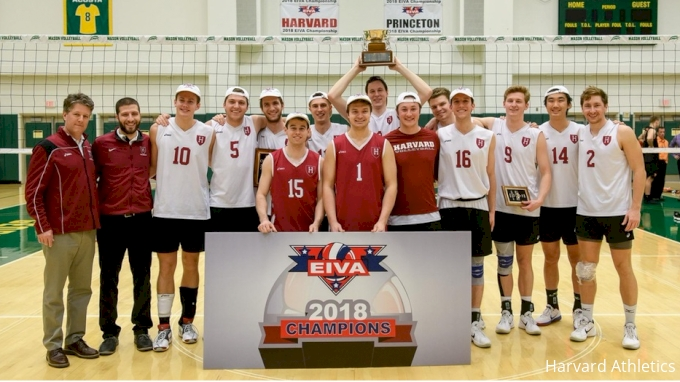 Last week in EIVA men’s volleyball featured one major upset, a couple of very close calls and continued excellence from two of the league’s top outside hitters. Keep reading to find out everything you need to know about the previous seven days in EIVA volleyball action and what’s coming up. Defensively, Charleston managed to keep things relatively even in its match with No. 4 UC Irvine. The Golden Eagles tallied three blocks to UCI’s four and 20 digs to the Anteaters’ 19; however, UC Irvine held a significant offensive advantage, recording a .472 hitting percentage to Charleston’s .175. The next match, a second-set victory 27-25 over Benedictine Mesa served as a bright spot for the Golden Eagles, but they couldn’t turn it into lasting momentum. In particular, Charleston struggled to get around the Benedictine block, while tallied 10 stuffs by the end of the match. Grand Canyon scored a win in straight sets, despite Charleston holding the Lopes to a .067 hitting percentage in the third. Notable Performances: Freshman setter Diego Villafane had 30 assists versus Benedictine Mesa, while freshman Lachlan Bray from Rowville, Australia, led the Eagles with 14 kills, adding two aces. Adriel Roberts’ five blocks played a key role in slowing down the Grand Canyon offense in the third set of Saturday’s match. Coming Up: Charleston heads east for back-to-back matches versus Princeton on Friday and Saturday. George Mason marked a new season-high team hitting percentage (.450) and its fourth victory in a row when it took down Coker in straight sets on Friday. Notable Performances: Hayden Wagner, who ranks second in the conference with 4.61 kills per set, once again led George Mason with 17 kills (hitting .467) and five block assists. Setter Justin Coleman quarterbacked the Patriots’ incredible efficient offense and led the team with seven digs. Middle blockers Langston Payne and Bryce Gatling each tallied four kills with no errors, with Payne finishing the match with a .800 hitting percentage and Gatling clocking in at .500. Coming Up: George Mason will test its talents against two MIVA foes this week: Purdue Fort Wayne and No. 11-ranked Ball State. After going down 1-2, Harvard managed to tie No. 11-ranked Ball State at two sets apiece in Friday’s match in Cambridge, but the visiting Cardinals didn’t make a single hitting error in the fifth set, making it hard for Harvard to compete. In winning the second set over Purdue Fort Wayne, Harvard posted an impressive .688 hitting percentage but couldn’t hold onto that level of performance in the third and fourth sets. Out of seven matches so far this season, four of Harvard’s opponents have been ranked in the top 15 nationally. Notable Performances: Sophomore Griffin Schmit posted 20 kills in the five-setter versus Ball State. Freshman Eric Li continued his streak of strong performances with 16 kills, hitting .423. Both kill totals mark new career highs. Setter Matthew Ctvrtlik also set a new career best with 46 assists. Schmit once again led the way with 18 kills versus Purdue Fort Wayne and Li set a new career-high hitting percentage with 10 kills and one error on 19 swings to average .474. Coming Up: Tough EIVA matches await the Crimson this week as they take on Penn State and Saint Francis on the road. The Highlanders did not compete last week and won’t take the court again until Feb. 11. An error-prone and streaky Penn State team had a tough time competing with No. 10-ranked Lewis on Friday. The Nittany Lions had 18 hitting errors, 18 service errors, four blocking errors and four reception errors in the three-set match. The next night, things started off well for Penn State as it won the first set over No. 7-ranked Loyola, but the Ramblers out-hit the Nittany Lions in the next three sets to win the match. Notable Performances: Henrik Falck Lauten led all players with 11 kills in the Lewis match. The Norway native then recorded Penn State’s first double-double of the season with 11 kills and 10 digs versus Loyola. Against Lewis, Jason Donorovich hit .462 with seven kills and just one error. Setter Cole Bogner celebrated a new career high with eight digs and tied his previous high with four block assists versus Loyola. Coming Up: Things don’t get any easier for Penn State this week as the team travels to the West Coast to face No. 1 Long Beach State and No. 9 UC Santa Barbara. Princeton celebrated just its second victory of the season last week as it took down UC San Diego in four sets, playing an efficient match that saw the Tigers hit .550 in the third set and out-ace the Tritons nine to three. USC, which recently celebrated an upset of then-No. 3 UC Irvine, handled Princeton in straight sets, but the Tigers almost had a chance at their own upset the next night versus No. 12 CSUN. Princeton out-blocked the Matadors 16 to 12 (a new season high for the Tigers) and held CSUN to a .000 hitting percentage in the fourth set, but ultimately the match came down to two points at the end of the fifth set and went the way of the Matadors. Notable Performances: Redshirt senior Kendall Ratter, who missed the entire 2018 season, had 10 kills in his season debut against UC San Diego and then hit .421 with 12 kills versus USC. Parker Dixon led all players with 25 kills in the UCSD match and had 24 versus CSUN. The junior also had eight blocks in the Tigers’ third match of the week. Coming Up: This week, Princeton plays at home for the first time in 2019, hosting Charleston for back-to-back EIVA matches Friday and Saturday. Sacred Heart couldn’t sneak away with a win this week, but the Pioneers did managed to take a set off of two tough MIVA squads, both ranked in the top 15 nationally. Against Ball State, SHU collected an impressive 12.5 blocks. Notable Performances: Libero Tim McIntosh’s 14 digs kept Sacred Heart in the game with Purdue Fort Wayne. Emerson Waumans led SHU offensively both nights, collecting 12 kills versus Fort Wayne and 16 in the Ball State match. Taylor Bloomquist led the blocking efforts versus Ball State, collecting a solo and four block assists. Coming Up: On Friday, Sacred Heart faces Saint Francis before taking on Penn State Saturday. Saint Francis’ five-set win over Ohio State marked the program’s second victory ever over the Buckeyes. Ohio State, which was ranked No. 14, will likely drop out of the rankings this week, but the win still represents a massive accomplishment for the Red Flash. Strong serving played a key role in Saint Francis’ victory, as the Red Flash out-aced its hosts nine to five. Notable Performances: Michael Fisher, the EIVA’s leading attacker, had 27 kills versus Ohio State. Setter BJ Blair had 51 assists in addition to seven digs, while Cole Carver led the defensive effort at the net with seven blocks. Cole Thompson had 12 kills but really starred behind the service line where he scored four aces. Coming Up: Saint Francis travels to Charlotte, North Carolina, this week to take on No. 2-ranked Hawaii, Belmont Abbey and Queens University of Charlotte.